In aerospace, defense and wireless communications, a variety of evolving challenges are making system characterization and troubleshooting more difficult. For example, radar and electronic warfare (EW) systems are becoming more dynamic and faster-moving, and may cover many cubic miles of airspace above the battlefield. The proliferation of multi-format, high data rate communication systems is leading to a much higher probability of interoperability issues. As signals continue to become more complex and agile, gap-free measurement techniques such as real-time spectrum analysis and time capture are moving from niche status into the mainstream. Instruments such as the real-time PXA signal analyzer are taking this a step farther by making these capabilities available within a traditional signal analyzer rather than a dedicated or single-purpose instrument. Keysight’s real-time spectrum analysis (RTSA) capability is an upgradable option for new and existing PXA signal analyzers, making the PXA the first mainstream signal analyzer to offer the opportunity to add real-time analysis after the purchase. This makes real-time capability available for about one-tenth the cost of purchasing a new real-time analyzer. Adding RTSA lets the user see, capture and understand highly elusive signals—known or unknown. To go deeper, a user can combine a real-time PXA with the Keysight 89600 VSA software to create solution that enables thorough characterization of complex signals. This backgrounder discusses the PXA’s technical innovations and the resulting benefits to those who need real-time RF signal analysis. It explains and discusses real-time analysis in concise terms and describes applications for the real-time PXA. The PXA is the first mainstream signal analyzer to be upgradable to real-time capabilities. An existing PXA can be readily converted in-place by the user without the need for hardware retrofits or re-calibration. As with other real-time signal analyzers, the real-time PXA uses ASICs and FPGAs to convert sampled signal data into signal spectra at a very high rate—nearly 300,000 spectra per second. Spectrum data is combined to create information-rich displays such as density (also called histograms). Alternatively, the stream of spectra can be sequentially tested against limits and logical criteria to produce a spectrum-specific and behavior-specific frequency-mask trigger (FMT). Wider bandwidth: Maximum analysis bandwidth of 160 MHz for real-time measurements matches today’s wideband signals and signal environments. The PXA is unmatched in performance for noise and distortion, and provides consistent performance between spectrum and real-time operation. Better dynamic range: Spurious-free dynamic range of up to -75 dB across the full 160-MHz bandwidth makes it easier to find small, fleeting and infrequent signals, even in the presence of much larger ones. Higher probability of intercept: Probability of intercept (POI) is the key benchmark for real-time spectrum analysis and the real-time PXA can detect signals as short as 3.57 µs with 100 percent POI. Integrated analysis capabilities: Adding the 89600 VSA software enables complete vector signal analysis and demodulation along with real-time spectrum analysis. Real-time FMT allows all VSA measurement functions—including demodulation and time capture—to be focused on the most elusive signals. Once isolated, complex signals can be transferred to RF signal generators or to math or simulation tools. Figure 1: FMT can be used to start a real-time capture of a transient event. 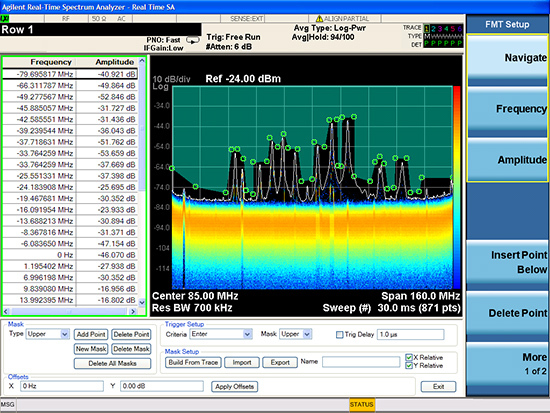 Vector signal analysis can then show multiple views and reveal detail such as time-gated spectrum (top) and simultaneous views of the signal such as power envelope (blue) and time waveform (green). The phrase “real-time analysis” and the capabilities it implies mean different things to different people. Fortunately, though, a consistent core concept can be defined as follows: In a spectrum or signal analyzer with a digital intermediate frequency (IF) section, real-time operation is a state in which all signal samples are processed for some sort of measurement result or triggering operation. In most cases the measurement results are scalar—power or magnitude—corresponding to traditional spectrum measurements. 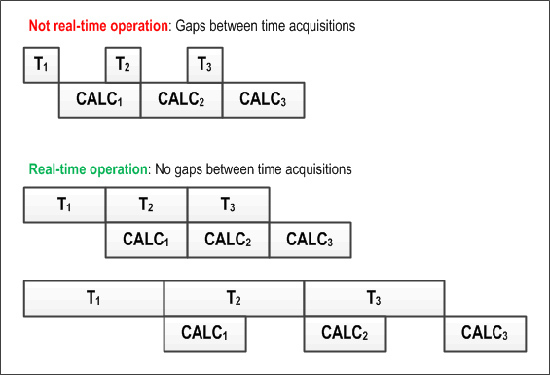 Figure 2: Real-time operation occurs when the calculation speed is fast enough to ensure gap-free analysis of sampled data. In this case each CALC includes computation of an FFT or a power spectrum as well as averaging, display updates, and so on. In general, the stream of spectra from real-time processing can be used in one of two ways: The spectra can be combined into a composite spectrum display or successively compared to a limit mask to implement frequency-mask triggering. From the preceding, a real-time RF analyzer may be summarized as having five key attributes: gap-free analysis, high-speed measurements, consistent measurement speed, advanced composite displays and frequency-mask triggering. Other approaches satisfy parts of this definition and provide essential types of real-time analysis for some applications. For example, vector signal analyzers use signal capture and post-processing to provide gap-free results for the length of the capture—which can be very long but not infinite—and can provide more complete analysis such as time domain and analog or digital demodulation. This type of operation will meet some user needs—and some definitions of real time—better than infinite-length spectrum-only analysis. Some vector signal analyzers also use real-time signal magnitude processing (rather than spectrum processing) to implement an unlimited-length IF magnitude trigger that is better than FMT for some measurements and a good complement to others. As noted above, the real-time PXA includes five key innovations: wider bandwidth, better dynamic range, higher POI, integrated analysis capabilities, and upgradability. Individually and collectively, these capabilities provide an important set of user benefits. Wider bandwidth: As the signal bandwidths and spans to be analyzed continue to increase, greater bandwidth is necessary. The PXA has the required combination of IF bandwidth, signal sampling and signal process to handle 160 MHz continuously. This gap-free bandwidth applies not only to real-time spectrum analysis but also FMT, gap-free time capture and real-time magnitude calculations for IF magnitude triggering. Better dynamic range: The PXA allows small signals to be detected in the presence of large ones by providing 75 dB of spurious-free dynamic range across its full 160-MHz analysis bandwidth. Dynamic range is enhanced by the low noise floor of the PXA itself and, when dealing with very small signals, can be further enhanced by adding the low noise path (LNP) option, which improves sensitivity while simultaneously handling high-level signals. Because the processing required for real-time analysis increases with the product of analysis bandwidth and bit depth, doubling both the bandwidth and bit depth will require about four times the processing power. Some analyzers perform real-time calculations with a limited bit depth to compensate for limited processing power. This reduces the dynamic range of real-time spectrum displays and FMT. Higher POI: The term POI comes from the field of signal surveillance and reflects the likelihood that a transient signal will be detected. The PXA’s advanced processing architecture combines with its 160-MHz analysis bandwidth and wide dynamic range to provide 100 percent POI for signals with durations as short as 3.57 µs—the best performance currently available. Gap-free analysis is just one element of POI. Within the instrument, other contributing factors are analyzer and processor dynamic range (including sensitivity), sampling bandwidth, processing continuity and FFT processing overlap. One key external factor is the power level of any signal of interest, and the PXA’s low noise floor increases the separation between small signals and noise. Integrated analysis capabilities: In some cases, simply finding an elusive signal is sufficient. The presence or spectral shape of the signal may be all an engineer needs to answer a question, confirm a problem or suggest a solution. In other situations, finding the signal is just the first step toward engineering a solution. This is when the combination of a real-time PXA, real-time FMT and the 89600 VSA software is especially useful. The real-time trigger can start any VSA measurement—one or many—in any measurement mode, including demodulation. The trigger can be initiated when a specific spectrum mask is entered or exited, or upon a more complex sequence such as exit followed by re-entering. Pre- and post-trigger delays are also available, allowing for measurements of signals prior to the trigger event. These capabilities make the real-time PXA plus VSA a great combination for measuring modulated transients, frequency-hopping signals, frequency settling, and undesired transients in signal sources such as VCOs or YIG oscillators. 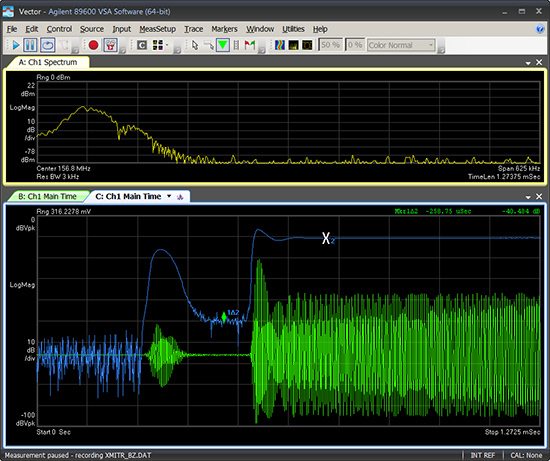 Figure 3: With FMT, mask parameters can be entered manually or set automatically by the analyzer from measured spectrum. If necessary, the user can then modify the spectral mask by changing, adding or removing spectrum-mask points. Upgradability: A spectrum or signal analyzer is a fundamental tool for every RF engineer. These analyzers provide a familiar user interface for measuring unfamiliar signals while providing a high degree of flexibility in frequency spans, frequency coverage and resolution bandwidths. They also provide excellent dynamic range and sensitivity. Given this combination of availability and familiarity, making RTSA an upgradeable option is the path many engineers will prefer. The PXA is the first mainstream signal analyzer to offer the opportunity to add real-time analysis after the purchase—and this makes purchasing decisions more flexible. It also makes real-time capability available for about one-tenth the cost of purchasing a new real-time analyzer. Offering this upgrade for a mainstream analyzer means that test assets can be more flexibly deployed in a typical lab equipped with multiple analyzers. It also eliminates the need for a special-purpose analyzer that becomes an under-utilized asset that sits on a shelf when real-time capabilities are not needed. Three additional capabilities are worth a closer look: histogram or density displays and FMT technology and uses. Histogram or density displays: As signals become more agile and signal environments become more complex, it’s increasingly important to represent a large amount of measurement data on a single screen. This is essential for real-time spectrum analyzers that generate thousands of spectra every second—many more than can be discerned by the human eye. As an example, the PXA can produce nearly 300,000 spectra per second but a user can see about 30 per second. Therefore, to take advantage of real-time results, each display update needs to represent about 10,000 results in a useful way. In this situation, the most informative displays are created by compiling statistics and displaying how often a particular measurement value occurs (e.g., a specific amplitude at a specific frequency). This histogram of measurement results is a spectrum measurement enhanced to show frequency of occurrence and can be considered a backwards-looking version of probability. These displays are coded using color or trace intensity, and a persistence function can be added to focus attention on more recent events as older data fades away. Trace data such as the most recent single display update, or an average, can also be overlaid as a trace similar to a traditional spectrum measurement. This approach allows engineers to see and focus on infrequent events or transients, then separate them from other behavior. By changing persistence and color-weighting values or schemes, specific behaviors can be highlighted. The real-time PXA further enhances these capabilities by providing complete trace-marker capabilities with persistence displays. FMT technology and uses: When looking for a specific signal, a powerful approach is to compare the fast stream of spectrum data to a user-defined spectrum mask and then generate a trigger when the mask is exceeded or when the signal enters the mask region. Further enhancements include conditional triggering on actions such as a signal exiting or re-entering the mask and various combinations thereof. This is FMT. The masks themselves can be a combination of upper and lower limits, and can be entered numerically or graphically. Perhaps the most convenient approach, however, is to let the analyzer use the measured signal environment to automatically generate a mask and then let the user modify the mask as needed. This process is simple and intuitive when the mask is shown along with the live measured trace. FMT may be used to generate successive triggers on a relatively frequency basis; however, one of its most beneficial and powerful uses is those situations in which the behavior to be measured is very rare and the wait between events may be minutes or hours. The FMT combines a high POI with fast action and, in the case of the 89600 VSA, a pre-trigger delay that captures the beginning or end of an event, or anything in between. The high-speed signal processing and data-dense displays of real-time analyzers can be used to benefit applications not described above. For example, averaging is necessary to produce accurate measurements of noisy and noise-like signals (e.g., those with digital modulation). Applying an averaging detector to real-time spectra can dramatically shorten the time needed to reduce variance to a desired level. This approach is included with the real-time PXA. In a swept analyzer, an averaging detector is normally the fastest way to reduce variance; it is also typically much faster than trace-to-trace averaging. However, in real-time analysis with FFT processing, the averaging detector can instead implement trace averaging, taking advantage of the higher processing throughput to produce a single-valued measurement trace with much lower variance. For RF measurements, averaging generally reduces variance by the square root of the number of independent samples. As a result, the speed improvement for a given variance may be as much as 100 times faster than trace-to-trace averaging in swept mode: square root of 10,000 spectra per trace update, assuming one spectrum per trace update. Another example is the possibility of seeing signals within signals. In a highly dynamic signal environment, it can be difficult to see small signals with low duty cycles when their frequencies are overlapped by wider, larger or more-frequent signals. Fortunately, the spectrum histogram can often be adjusted to enhance the small differences that reveal elusive signals. Any situation in which signals can be separated by frequency of occurrence is a candidate for this approach. The primary purpose of even the most advanced tool is to allow engineers to follow their instincts and deductions—and make additional measurements to determine cause and effect, or optimize a signal or system. This is one of the key ideas behind the upgradeable RTSA option and the ability to add it to new or existing PXA signal analyzers. The ability to combine a real-time PXA with the 89600 VSA software enables system developers and signal analysts to go even deeper with real-time and post-processing analysis of the most elusive signals.